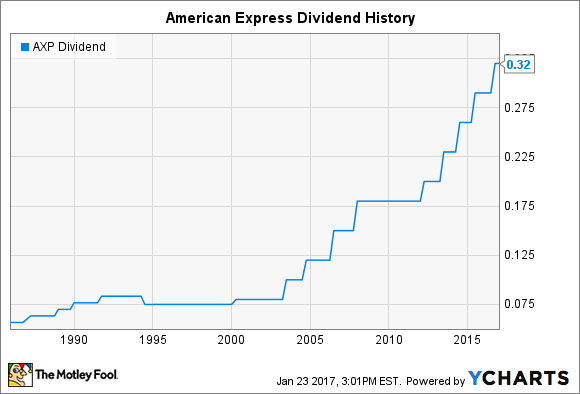 Will American Express Raise Its Dividend in 2017? The card pioneer has an impressive recent record of boosting payouts, but will challenges hold back its dividend this year? American Express (NYSE:AXP) helped pioneer the charge card industry, and even now, the company's brand carries an aura of affluence that rivals have struggled hard to try to duplicate. Yet American Express has fallen back from all-time highs over the past couple of years, and the loss of its branded-card partnership with retail giant Costco Wholesale (NASDAQ:COST) was a high-profile setback that forced the card company to retrench and seek out new alliances. Still, one thing that AmEx has focused on more recently is to treat its shareholders better by boosting its dividends more quickly than it generally did in the past. Over the past five years or so, growth in its quarterly payout has been strong and consistent. Shareholders want more of the same going forward, but will they get it? Let's look more closely at American Express to see whether it's likely to raise its dividend in 2017. American Express has had a good track record of paying dividends, but growing them is another story. Throughout the 1990s, dividend growth was nonexistent, with early boosts giving way to a slight decline. In 2000, American Express made its first dividend increase in eight years, and investors had hoped that the company would start embracing rising dividends. Yet even then, the company waited about three years before rewarding shareholders again with another increase. During the housing boom of the mid-2000s, American Express finally seemed to join the dividend bandwagon, more than doubling its payout in the space of just four years. Yet then, the financial crisis hit, and that crushed many stocks in the financial industry. AmEx shareholders felt the pain in seeing the stock's price fall sharply. AXP Dividend data by YCharts. Yet unlike many of its peers in the financial industry, American Express never did cut its dividend, but rather simply left it unchanged for several years. Indeed, then-CFO Daniel Henry pointed out that fact back in early 2011, when many big banks were looking to restore previously cut dividends. Instead, AmEx focused primarily on buying back shares, with the goal of returning about half of earnings through a combination of buybacks and dividends. The repurchases have had the impact of reducing share count, which in turn has helped per-share earnings figures and made dividend increases less expensive on the whole. The pause in AmEx's dividend growth ended in 2012 with an 11% boost to the quarterly payout. After that, double-digit percentage growth in American Express' dividend became commonplace. That didn't stop AmEx from giving investors some surprises, such as its decisions to go from an April dividend hike in 2012 to July increases in 2013 through 2015, and then waiting until October for its boost in 2016. However, the moves have more than kept up with its share-price growth over that period, helping to keep the yield at a below-market average but still respectable level of 1.7%. One thing to remember is that American Express has had to get approval from the Federal Reserve in going through the comprehensive capital analysis and review process. In recent years, the Fed has had no objections to American Express' proposals, but it's always possible that it could change its mind in the future. Some remain nervous about American Express' recent challenges in its fundamental business. Challenges related to its card business have those following the stock expecting flat earnings in 2017 compared to last year, and that in turn could make it more difficult for AmEx to justify higher dividends. Yet projections for 2018 are for greater than 10% growth in per-share earnings. With a payout ratio of just 21%, American Express has room for a dividend increase even if bottom-line growth lags temporarily. It therefore seems likely that despite any headwinds, American Express will still look for a roughly 10% boost to its dividend, which would take it to the per-share range of $0.35 to $0.36. At that level, AmEx would still have a yield below 2%, making it far from a dividend giant. Nevertheless, that seems to be where American Express wants to be, and that makes it all the more probable for the coming year.